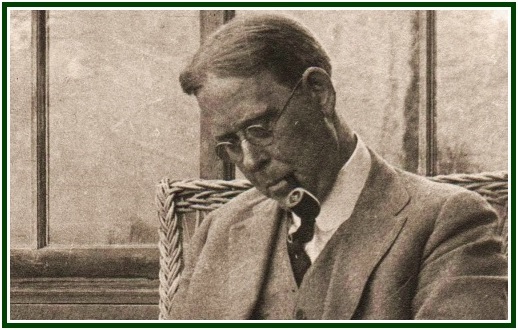 John Garrigues (photo) was born on 12th September 1868.
style indicates it was written by J. Garrigues. It seems hopeless to try to elucidate much concerning the real and true meaning of sacrifice in a civilization so little ready to concede that sacrifice is one of the fundamental principles of Life itself. If we would have an answer, we must first free ourselves from all ideas of a personal God, and take a wider view of the God, or Gods, of Great Nature. All of the Secret Doctrine tends to impress the mighty idea that manifested, visible nature is impelled from within, outward, by almost endless hierarchies of sentient beings – Gods – we may call them, ranging from the highest Dhyan Chohan, down through the lower deities, or devas, to elementals. All forms of life are composed of elementals; all that we do is done by the aid of elementals; all that we think has its life through elementals, for every thought on leaving the mind coalesces with an elemental, informing it, and impressing it for either good or evil. The thinking of man, therefore, characterizes and sustains all nature in its present state; so, too, the entire host of lower elements attaches man to a body and material existence. The maleficence of both plants and animals bears witness that man is far from accomplishing this great task; they have been fed by his iniquity and now groan in travail awaiting their redemption, which can come through him alone. Even vegetable nature has been so impoverished that it can no longer bring forth perfect foods for the body. This condition will last as long as man continues to stimulate the fertility of nature for his own greed and covetousness, instead of making the increase contribute to sweeter and saner living. The higher elementals needed for the production of such foods have long left the earth, there being no proper sustenance furnished them by man’s thinking. As pure air is a necessary form of nourishment for our gross physical bodies, so pure thinking is necessary for the lives that constitute the finer bodies or essences of nature – man included. Whether the food be physical, psychical, mental, or spiritual – all is produced by the sensations, desires, thoughts, or will of man; and the “gods” composing these various bodies feed upon their own proper and corresponding kind. Of all these, Krishna says, He is the food and sacrificial butter. If each of the lower kingdoms has sacrificed itself for the one above it, man surely should do no less, but worship with sacrifice the God within – the Atma-Buddhi-Manas, enshrined in his own flesh. Without sacrifice there is no worship; and sacrifice may take many forms. First of all, the Higher Self must be provided with a physical instrument. H. P. Blavatsky has said that it is possible to procreate Buddha-like children, but whether we attract to ourselves pure or vicious souls depends on our will and action, that is, on the nature of the sacrifice. There are great and wise beings awaiting rebirth upon this planet, who can incarnate only in bodies corresponding to their exalted nature. To furnish pure vehicles for these Gnanis  of old requires on the part of parents the sacrifice of all selfish and sensual desires. Having gained a body, the God within becomes the victim of the lower self. It is indeed the Lamb (type of the sacrificial Ego) slain from the foundation of the world. The imprisoned God hungers for righteousness and can be fed only by noble aspirations and right actions. Only as the mortal recognizes the indwelling Immortal and sacrifices all his sinful intentions to it, can this high God nourish him, thus bringing about the highest felicity. As man performs the proper sacrifices, the more advanced beings of the race sacrifice themselves for him. In fact, no human progress were possible did not these Great Ones leave their high estate and come among ordinary mortals, though but a few profit by the supreme renunciation. By their example and teaching they nourish those who sit starving for the bread of wisdom, the bread that feeds the shadow, and the eternal man as well. So we come at last to see that all life is a reciprocal process of sacrifice and feeding – losing life, in order to gain it. Hence, he who enjoyeth what hath been given him by the gods, and offereth not a portion unto them, is even as a thief.